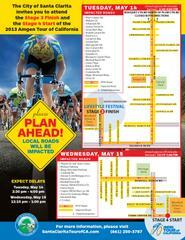 Amgen Tour of California Traffic and Event Information for Tuesday, May 14, and Wednesday, May 15. The City of Santa Clarita returns for the fifth time in race history as a host city for the 2013 Amgen Tour of California with the Stage 3 Finish on Tuesday, May 14, and the Stage 4 Start on Wednesday, May 15. The City of Santa Clarita will kick off the Amgen Tour of CA with a series of events including a viewing party at Salt Creek Grille, SENSES Rock the Bike, and Bike to Work Day. Please join us on Tuesday, May 14 for the Lifestyle Festival, which will take place at the Westfield Valencia Town Center at the corner of Citrus and Magic Mountain Parkway, from 11:00 a.m. to 4:00 p.m. For more information on the Amgen Tour of California and related events go to SantaClaritaTourofCA.com. 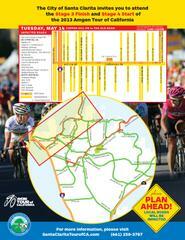 Please be aware of the significant traffic impacts to local roads during the course of the event. Plan ahead and avoid impacts by checking for the latest traffic information at www.SantaClaritaTourOfCA.com. 12:45 - 1:30 p.m. There will be an approximate 20-minute closure of southbound San Francisquito Canyon Road, west to Copper Hill Drive, and through the industrial center to the I-5 Freeway between 12:45 p.m. and 1:30 p.m.
2:30 - 4:00 p.m. There will be an approximate 40-minute closure of southbound Bouquet Canyon Road west to Valencia Boulevard, and to Magic Mountain Parkway between 2:30 p.m. and 4:00 p.m.
12:15 - 1:00 p.m. There will be an approximate 10-15 minute closure on McBean Parkway, from Town Center Drive north to Newhall Ranch Road, and to Highway 126 between 12:15 p.m. and 1:00 p.m. Emergency vehicles will have continuous access to the entire Santa Clarita Valley at all times during the race as the safety of residents and spectators alike is the number one priority to both the presenters of the race and all agencies involved.